The pinafore fetched the highest price of any item during a two-day auction of Hollywood memorabilia. This photo combo shows, at left, actress Judy Garland as Dorothy in a scene from "The Wizard of Oz," and at right, is an Oct. 16, 2012 file photo showing the dress Garland wore in the movie, on display in London. On Sunday, Nov. 11, 2012, auction house Julien's Auctions said the gingham dress fetched the highest price of any item during a two-day auction of Hollywood memorabilia that attracted bids from around the world, selling for $480,000. 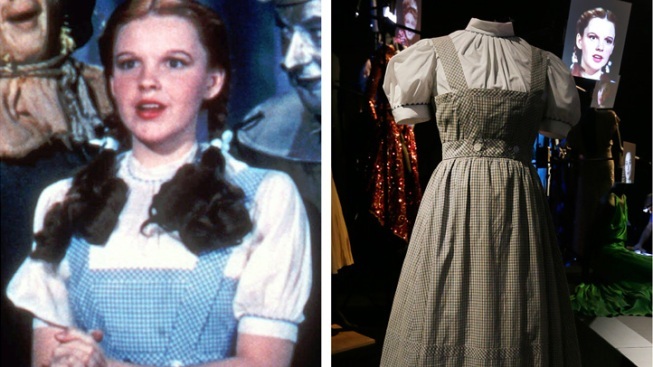 The now-faded blue gingham dress Judy Garland wore in "The Wizard of Oz" has sold for $480,000. Auction house Julien's Auctions says the pinafore fetched the highest price of any item during a two-day auction of Hollywood memorabilia that attracted bids from around the world. The auction ended Saturday in Beverly Hills, Calif.
Steve McQueen's racing jacket sold for $50,000, as did a purple skirt worn by Marilyn Monroe while filming "River of No Return" in Canada. Julie Andrews' "Sound of Music dress" brought $38,400. Sunglasses worn by Jean Reno in "Leon" went for $8,320, while Johnny Depp's shades fetched $3,250. Bidders also snapped up pieces of royal wedding cakes. Prince William and Kate Middleton's cake sold for $7,500 while Prince Charles and Princess Diana's cake sold for $1,375.